Johnny: [to Terry] You take it from here, Slugger. 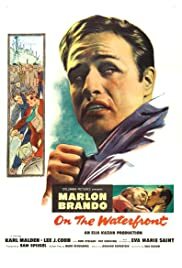 Q: Is "On the Waterfront" based on a book? Q: Just because Terry took a dive that one time, how did that end up ruining his career? Q: Why did Tommy kill all of Terry's pigeons? Still powerful after all these years, it's easy to see why this film won so many awards. Even though it isn't classified as "film noir," it might as well be, as it has the earmarks of one: gritty, downbeat with a feeling of dread, magnificent black-and-white cinematography, etc. It's certainly not a "fun" movie but if you appreciate great film-making, you have to rate this near the top of the list Not only is the direction (by one of the all-time greats, Elia Kazan) superb and the photography striking, the acting also is top-rate. Marlon Brando was just riveting to watch in here and deserved all the accolades he received for his performance. Talk about a guy with mixed emotions and a tormented soul! Eva Marie Saint, as Brando's "conscience" and love interest, proved to be worthy in her role. The rest of the characters were angry people, always shouting it seemed, always upset at someone. Even the priest, played by Karl Malden, was that way although one of his passionate speeches was remarkable to hear. How many films does one hear about Jesus Christ being everywhere men are? None I can recall, offhand. He, like Saint's character, also influenced Brando to do the right thing. Lee J. Cobb filled his bill as the angriest of them all, the labor boss who would have anyone killed who dare speak out against his illegal practices, and Rod Steiger was his normal intense self as Brando's older brother. Hey, almost everyone was intense in this film. It gets you involves and wears you out by the end. 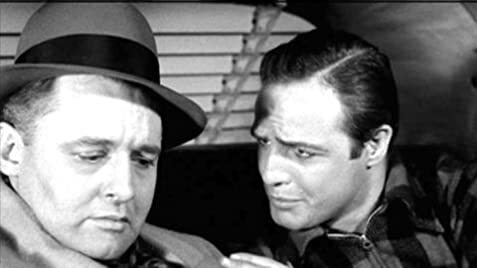 Steiger and Brando's conversation in an automobile fairly late in the film ("I couda been a contenda") is one of the most famous scenes in movie history, but I found many memorable scenes in this movie....too many to recount here. Suffice to say if you are looking for a hard-nosed drama with great acting and photography, a film that still looks and sounds up-to-date in many respects, don't be afraid to give this "oldie" a look. You'll see why it's considered one of the best movies of all time. 85 of 137 people found this review helpful. Was this review helpful to you?